Take an evening tour around the Floridian swamps searching for the awesome Florida Alligator. The night tour is your best chance to see alligators in the wild and a must for those who love speed, a hint of danger and the dark! 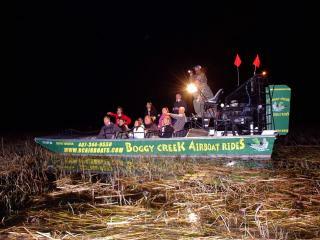 This airboat tour is for those who want to go to the farthest extremes in adventure and thrills and are not afraid of the dark. Search the swamps for the intimidating Florida Alligator as they glide across the marsh seeking their next prey. The only way to see these impressive dinosaurs is in their territory. The only way to spot these impressive reptiles by night is with the light of the captain’s miners cap! Watch for the red eyes on the surface of the water searching hungrily for their next prey. Tours are available daily throughout the year. You must check-in for your tour 30 minutes before the start time.